Local sounds • Provo band created after leader leaves behind hip-hop world. Before last year, Provo's Scott Vance was a DJ and rapper who performed in local hip-hop groups such as Can't Stop Won't Stop. But then the summer of 2011 arrived, and despite can't stopping and won't stopping, he stopped. "Last summer I decided to switch gears completely," Vance said. "I sold all my DJ equipment and bought a Gretsch hollow-body guitar and a 1963 Ford Galaxie. I drove the car around for two months to get a feel for the era of music I wished to channel. I then picked up my guitar and began writing songs that had a rich surf-rock groove. I figured people needed to hear the music I was creating. So I got three good friends together to start a vintage surf-pop-rock band." Vance, on lead vocals and guitar, is joined in the band by Tom Brinton on bass, Ben Zabriskie on lead guitar, Eric Call on keys and horns, and a percussionist whose stage name is simply Tony the Drummer. The band recently posted a high-concept video for its single "Heartbeat," taken from its debut, self-titled album. Vance answered questions about Utah County, inspiration and what Spice Girls song he'd like to perform on a tribute album. Is there a prejudice about bands from Utah County? I've heard there is. I don't really mind if there is, though. Our music should speak for itself, and I feel enough Utah County bands have broken that mold. If you were asked to contribute a song to tribute albums for The Beatles, Rolling Stones and Spice Girls, which songs would you contribute? The Beatles: "Hey Bulldog." Rolling Stones: "She's a Rainbow." The Spice Girls: "Say You'll Be There." What inspires you? What doesn't inspire you? All experiences, past and present. All genres of music. If you fail to find inspiration in everything, you stunt possibility. However, I feel I am most inspired by hyperemotional situations. In that instant, my mind has no emotional roadblocks. I have complete understanding of my feelings and how to transform them into music. What is the best way for people to learn more about your band? Listen to our album. The second best way is to hear us in concert. 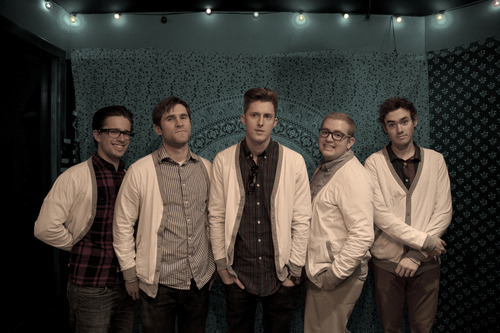 To learn more about the Provo surf-rock band, visit http://www.TheNewElectricSound.com.